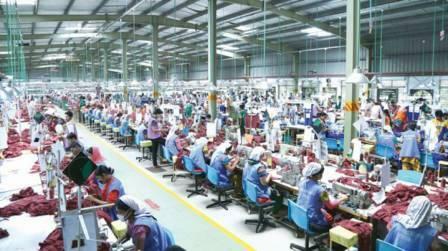 Ibrahim Khalil Jewel: Year 2021 will be one of the most successful one for Bangladesh’s ready-made garment industry, reveals the government’s manifesto ‘Vision 2021’. Bangladesh clothing manufacturers are looking at exporting over $50bn worth of apparels and being counted among the top destination for sourcing clothes. Bangladesh is one of the most preferred sourcing destinations for global apparel companies owing to its low cost manufacturing. While this was true for low-end apparels so far, now, competitive advantage is making way for high-end clothing as well. Companies like Hugo Boss, Ralph Lauren, and Emporio Armani are increasingly sourcing from Bangladesh. In the past few years, Bangladesh’s exports and sustainability have both grown faster than most global counterparts strengthening its momentum. For instance, denim maker Vintage Denim is extremely conscious about workers’ wellbeing. Vintage Denim offers up to Tk 25,000 per person or family for their healthcare needs. This includes: free basic check-ups and covers surgery and ambulance fees, maternity and obstetrical problems etc. There is an option of paying back in installments if the costs are too much to bear. These moves helped the factory reduce employee turnover by 30 percent. Among other things, the country’s success can be attributed to the academic institutions that have come up to address the demand for apparel education. For example, the Bangladesh Garment Manufacturers and Exporters Association (BGMEA) has a pioneering institution called BUFT (BGMEA Institute of Fashion & Technology) and there are many others both private and government owned. In the past, their aim was to just provide basic education on merchandising but with industry expansion the curriculum has expanded to include engineering concentrations, part-time intensive diploma programs, and high-end fashion. This combination has helped the country make a mark in global apparel industry. Concepts such as lean manufacturing have improved efficiency. It is also constantly working on quality control, merchandising, production, etc. As per the country’s vision, by 2021, a large portion of clothing manufacturers will be catering to high-end suppliers, at a quality that is parallel to China and other countries with high-end apparel manufacturing. Bangladesh clothing manufacturers have been quite aggressive in making their factories greener. For starters, the top three LEED certified factories in the world are based in Bangladesh, the country has seven out of the top 10 LEED certified apparel manufacturing plants, there 67 factories in Bangladesh that are LEED certified, and 222 factories are on their way to becoming LEED certified. The government is also encouraging this trend by offering loans at 9 per cent rate, much less than the national interest rate for any industry. Going by the trend, it will soon become the country with the most environment friendly apparel industry and be an example for others to follow.